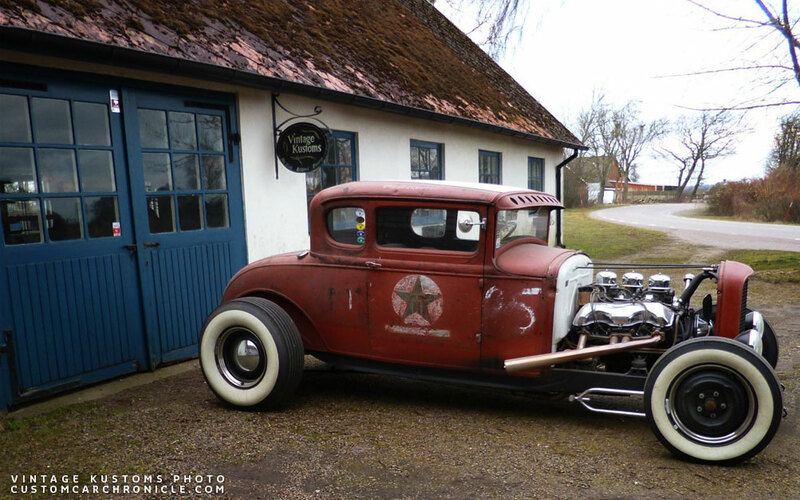 Vintage Kustoms is a relatively new shop in the South of Sweden, where owner Kenneth Kristiansson creates wonderful period Hot Rod’s and Custom Cars. 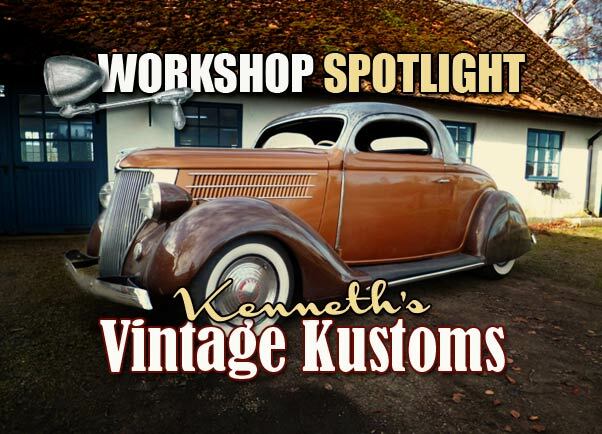 Kenneth has been into Hot Rods and Custom cars for as long as he can remember. As a kid he saw some of these special cars around town, and later in life he started to read the magazines that featured the Hot Rods and Custom Cars. Kenneth slowly started to develop a passion for nostalgia stuff, including the cars he liked. Period Hot Rods and Customs Cars were part of that. He started work as a metallworker doing mostly heavy constructions from blueprints to finished products. 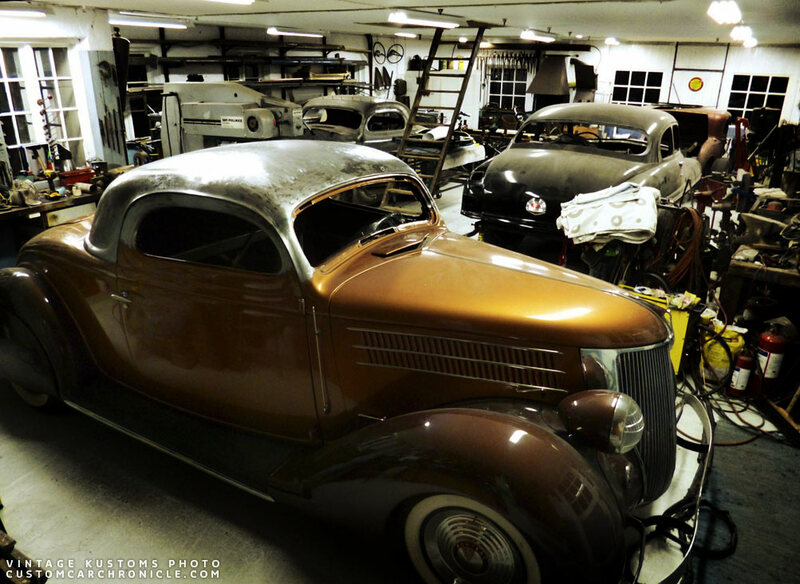 Kenneth already performed Hot Rod and Custom work from his small home garage for the last few years. Recently Kenneth relocated into an old forge building. After spending month or cleaning up 60 years of collecting stuff from the previous owner, Kenneth was finally able to get his new dream shop open a couple of month ago. 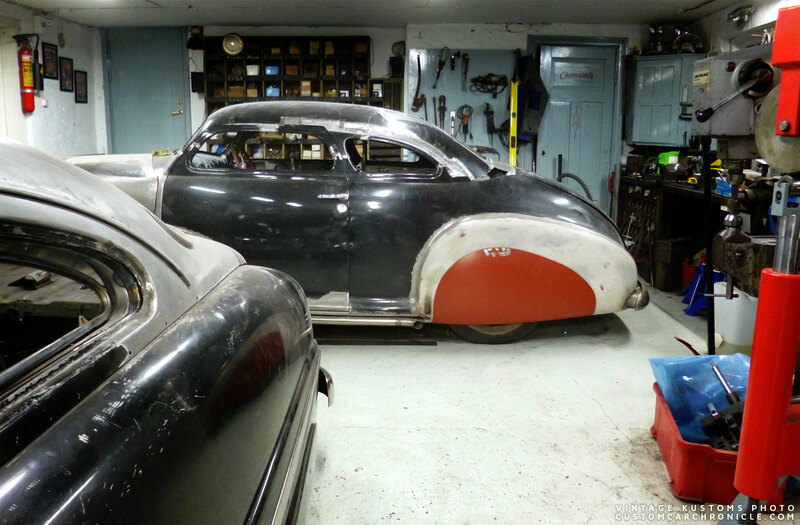 And a decades old dream of opening his own Hot Rod, Kustom Car and Race Car shop became reality. Kenneth personal 1931 Ford coupe Hot Rod in front of the new shop. 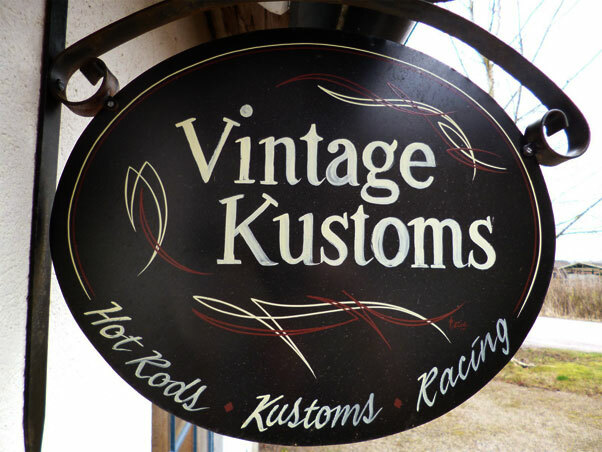 He named his shop Vintage Kustoms and he works on Hot Rods and Customs built in traditional style. 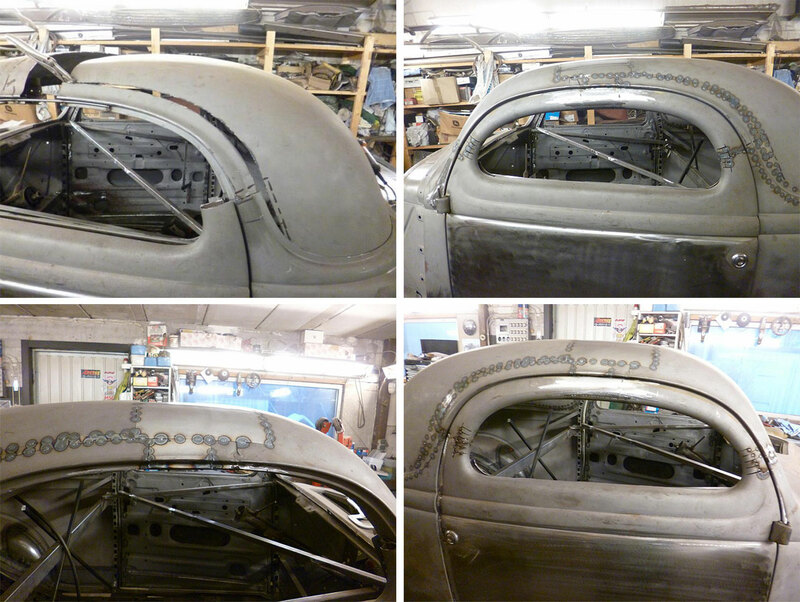 But Kenneth also takes on building historic racing cars and he does everything from chassie to body works. 1940´s and early 50´s styled Customs and Hot Rods is what really turns him on, but he also enjoys working on early 1960´s mild kustoms. 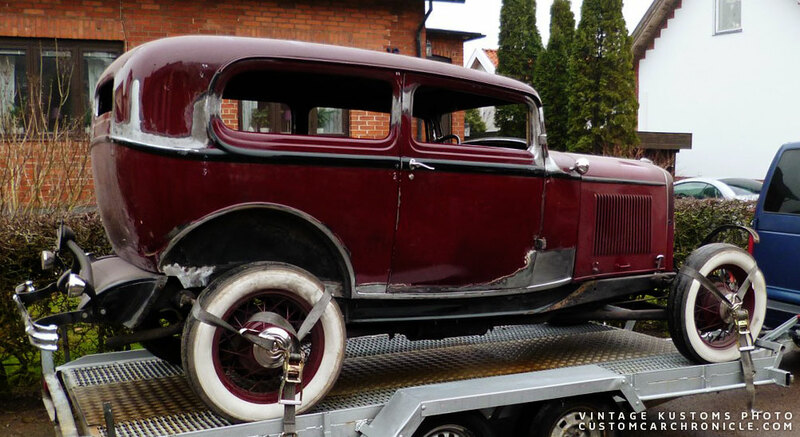 Kenneth recently finished a chopped 1932 Ford Tudor for a well known Swedish hot rodder. 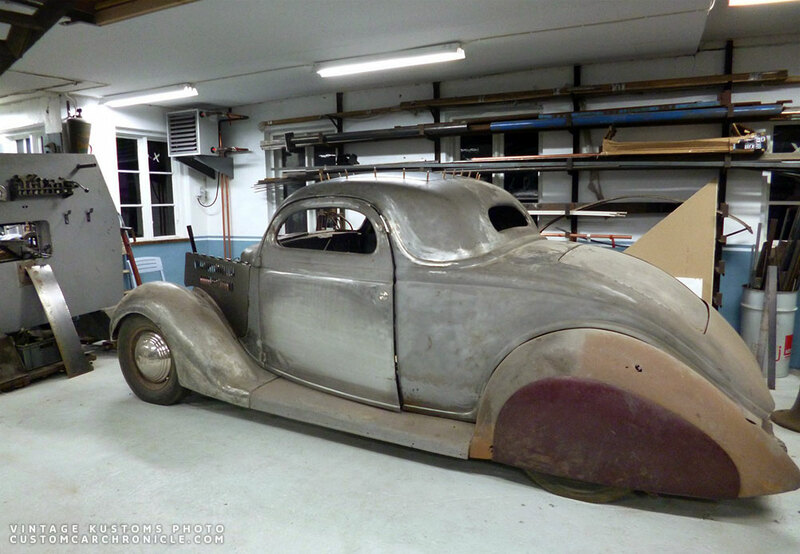 He also finished the chop on a 1936 Ford coupe for a client from Denmark and is currently working on an 1950 Mercury that came in to the shop for some rust repair and a chopped top. 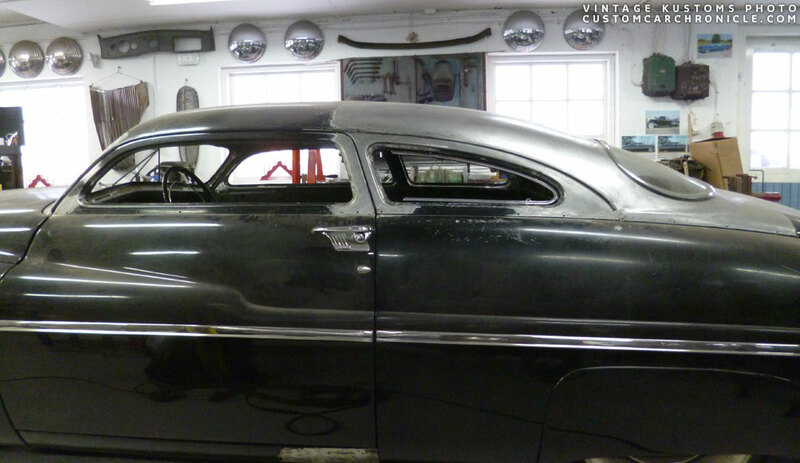 The progress on the 1950 Mercury can be followed on the CCC-Forum thread Kenneth started. 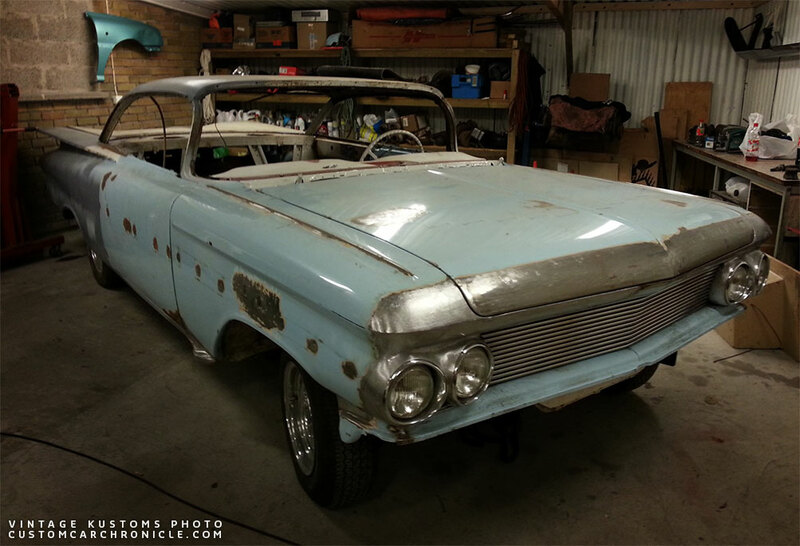 Kenneth is also working with his eldest son on a 1959 Chevy period mild custom. And for the Racing part Kenneth has a DeTomaso Pantera in the shop that will be built into a group 4 racing car and will be raced in the european historic racing series. Below are a few of the Vintage Kustoms shop projects that are either still in progress or have been finished recently. At the end of this article you will find the contact info to get it touch with Kenneth if you have any questions for him. 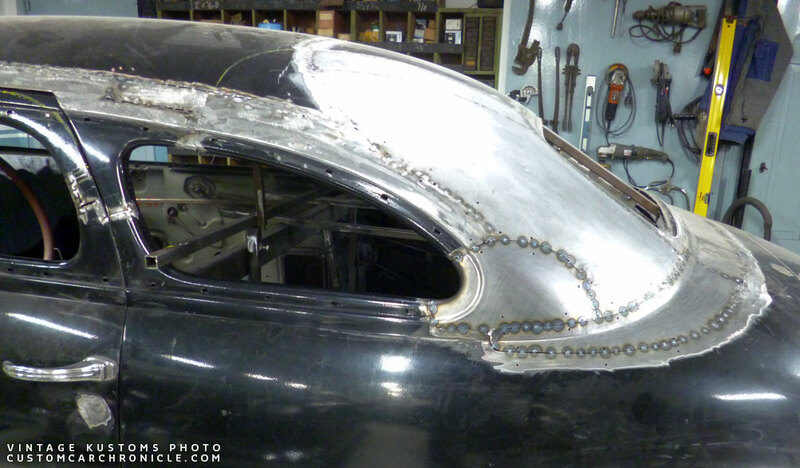 Kenneth’s personal 1940’s styled 1936 Ford coupe project during the chopping process. 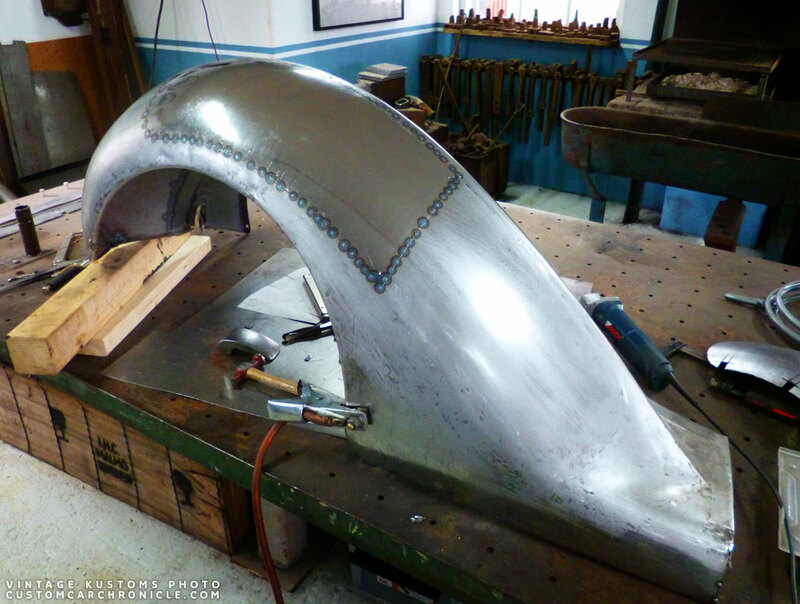 Kenneth loves to work with metal and metal finished the body as much as possible as these photos show. 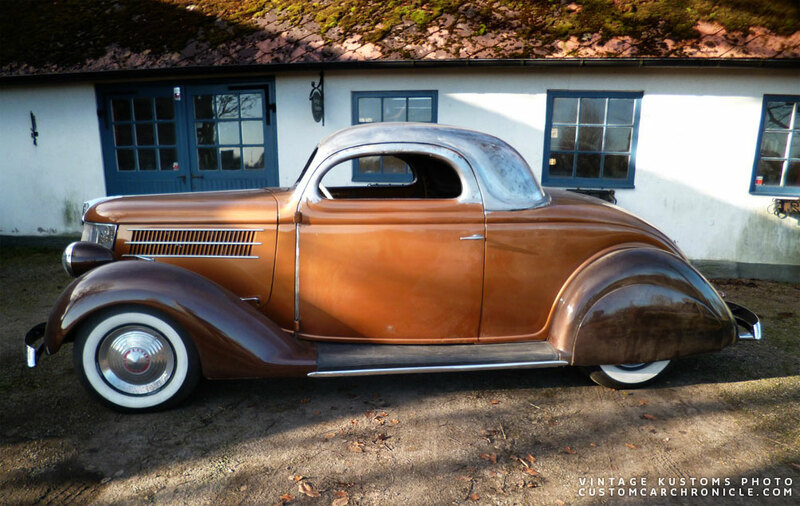 This photo of Kenneth’s ’36 Ford gives us a good feeling of the project and the style he is after. The main chop is done in this photo, and a new metal roof insert has been shaped to fit the factory opening. 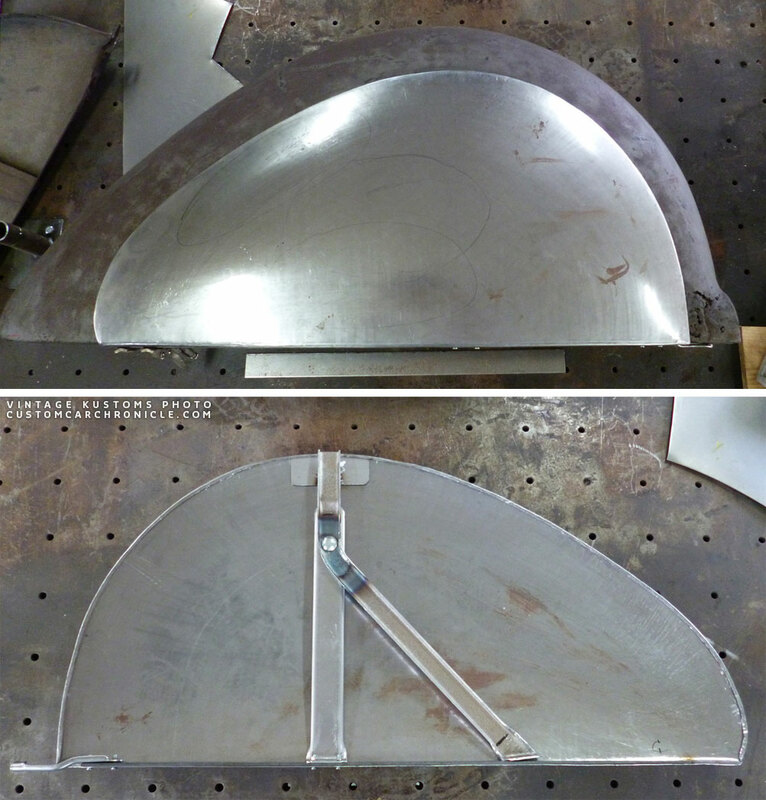 Kenneth shaped his own solid hood sides and had a friend push some great shaped louvres in them for extra cooling. Look at the shape of the side windows after Kenneth was done chopping. Work on the top with Kenneth’s Hot Rod in the corner, and the new client project 1950 Mercury on the right. Repair work on the drivers side front fender. 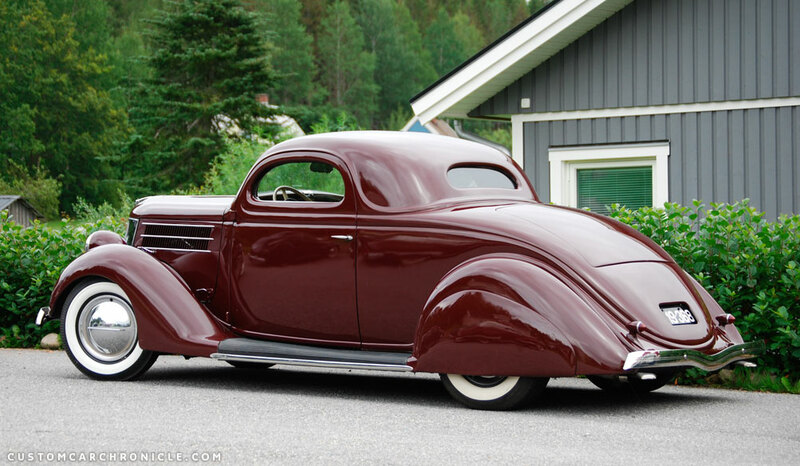 Kenneth has been asked many times about fender skirts for ’36 Ford fenders. 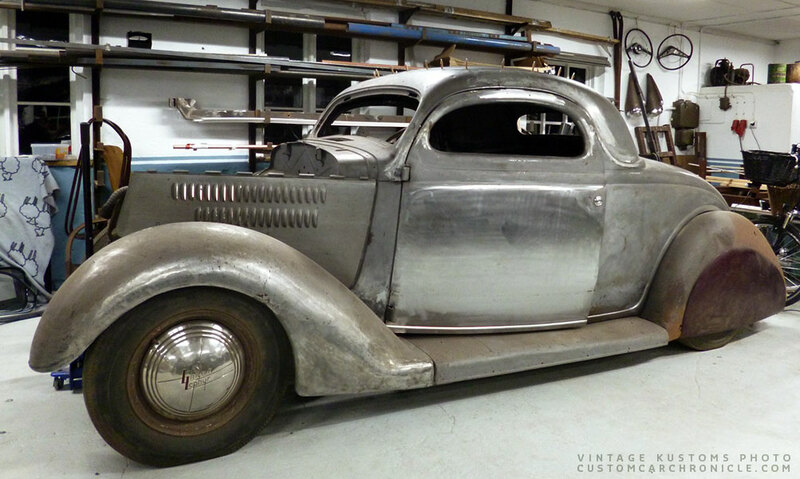 For his own ’36 Ford project he created these all hand made skirts shaped after the ’39 Ford units, but with dimensions and specially fitted to ’36 Ford fenders. The skirts meassures 19 3/4″ high and 40″ long. If you need a pair for your own ’36 Ford, just contact Kenneth for more info. A very happy client picks up his 1932 Ford Tudor that Kenneth chopped and did some rust repair on. 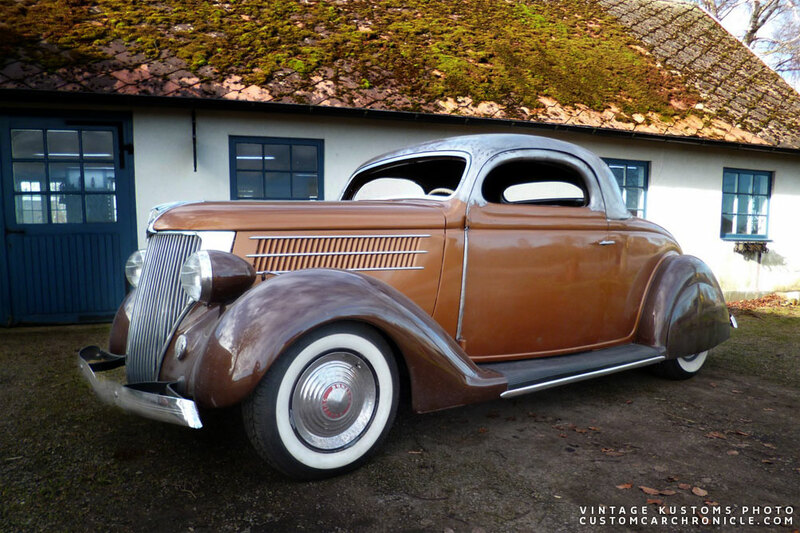 Lars from Denmark drove his 1936 Ford up to Kenneth’s shop in Sweden, after he had seen the work Kenneth performed on his own personal 1936 Ford. Lars his coupe was chopped 3″ at the front and 4″ at the back, slightly different than Kenneth his own Coupe. 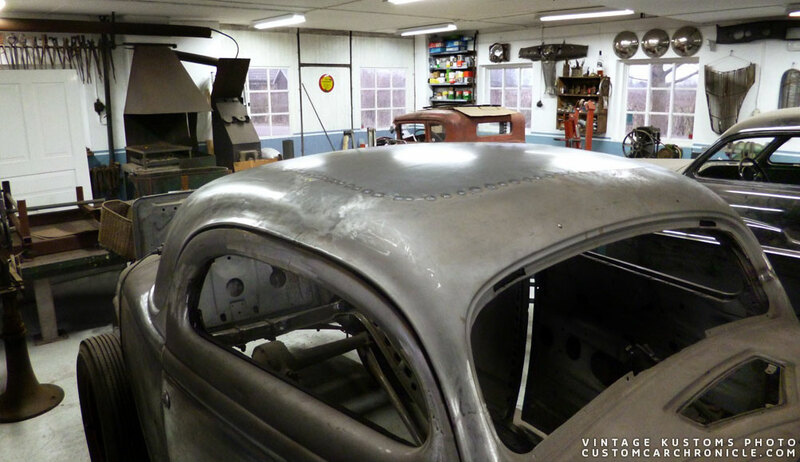 Another nice overview photo of the Vintage Kustoms shop shows Lars his 1936 Ford almost ready to be picked up for his home voyage to Denmark. In the back are some of the other shop projects. This photo shows the beautiful flow on the new shaped top on the day Lars picked up the car. 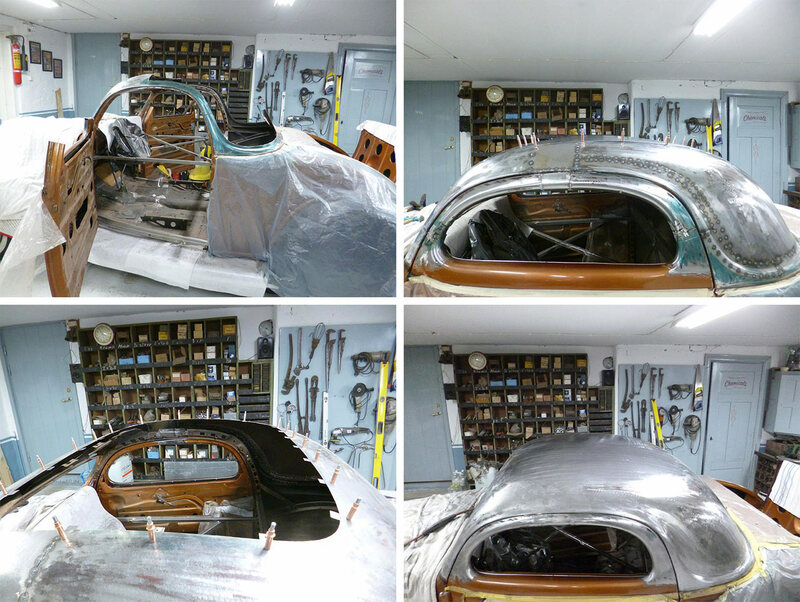 Lars is currently repainting the Ford and will slowly finish this car as early 1950’s period custom. Kenneth likes to step back from his projects and walks around his projects to view his work from all angles. Ensuring that no mater from which angle you view his handy work, it always flows, and looks at it very best. The top on Lars his ’36 Ford is a perfect example of that. 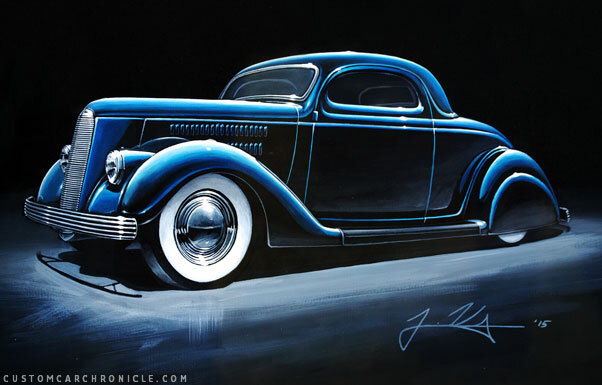 Lars’s his ’36 Ford coupe freshly finished in the summer of 2015. The 1959 Chevy early 1960’s period mild custom is the project Kenneth works on with one of his sons. 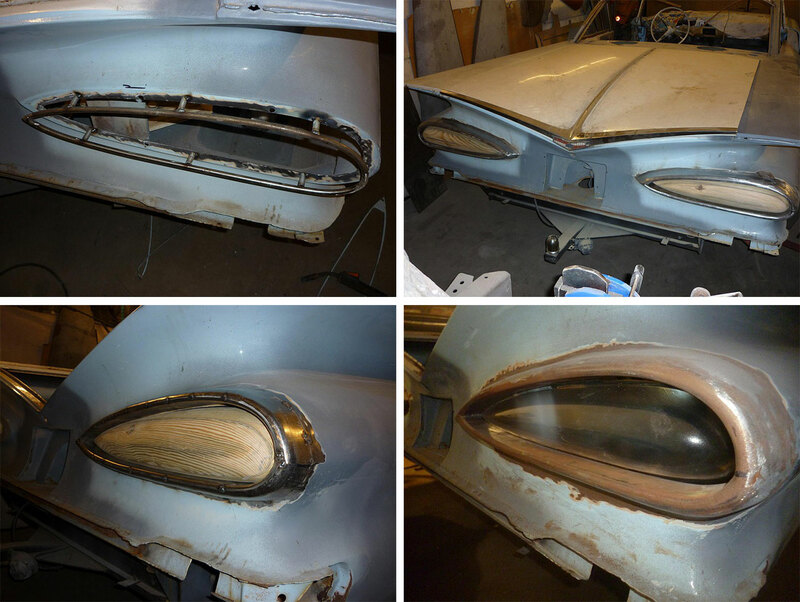 So far a lot of work has been done to make the 1960 Buick headlights flow into the Chevy body, create a stainless tubing grille, remove the “eye brows” grilles from the front and reshape and round the corners on the hood. At the back a new extended shape for the taillights was created from bent tubing and shaped sheet metal. A hand shaped wooden buck was shaped to fit the new opening and used to vacu-form new taillight lenses. A sample in clear plastic is shown in the photo on the far right. Once everything is perfect new units will be shape in clear red. Half way thru the chopping process of the ’48 Chevy. The main work has been done, but the curve from the top to the cat-walk still needs to be shaped. New sail panels, rear quarter window corners and sections to connect the cat-walk to the top were shaped by Kenneth. Early in the process, the main roof has been tacked in place, the sail panels removed and the shape of the rear quarter windows it finalized. New sail panels and sections of the top were shaped to make a perfect flow. Lots of time was spend on the window openings to get everything to look like this is how it came from the factory. Chopping and reshaping of the rear quarter window and creation of an all new rear window trim. To Follow Kenneth’s work progress on the CCC-Forum. I wish you much success with your new shop. Not only masterful craftsmanship, but a true artistic eye. Kenneth, the best to you! Thanks guys and a big thanks to Rik for making this article and showing it on the main board. Very clean work with great styling…awesome! Sanitary craftsmanship! This aint no ordinary chop shop! Rock n Roll!! !